From the Baldwin County Courthouse, go east on Hancock St. and follow Highways 22/24 southeast for 2 miles. Turn left at Lake Laurel Road. Go 3.4 miles and turn right on Moran Springs Road. Go 0.8 of a mile. Cemetery is on the right with a small dirt road leading into it. 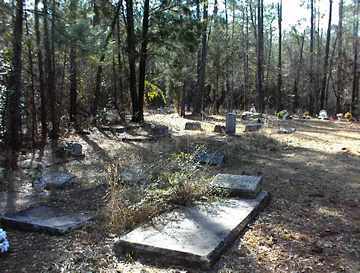 The old graves extending into the woods and the appearance of some of the graves suggests that this may have been an old plantation cemetery at one time. 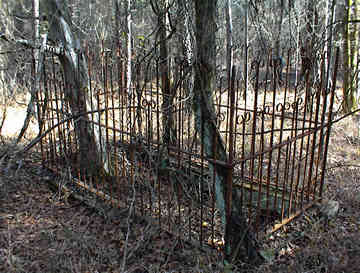 Perhaps as many as 100 unmarked graves extend into the woods. Also, 4 old unmarked slabs, 1 person-sized area enclosed by wrought iron fence. All is well. No death date. On same gravestone as Hattie Collins. Very difficult to read. Best guess. Cannot read last digit of death year.